Krishnanagar, Feb.27: The state government has decided to set up a new sweet hub in Nadia’s Krishnanagar to satisfy the sweet lovers passing over the NH34. The new sweet hub, similar to that Burdwan’s Saktigar located on Durgapur Expressway, is all set to come up exclusively with the traditional sweet items of Nadia at the gateway of Krishnanagar town adjacent to NH34. Acting with alacrity on the advice of chief minister Mamata Banerjee, the Nadia administration would soon set up the sweet hub, as a definite stop over for passerby on the NH34, at the local PWD more, which is expected to be materialized by the coming Durga puja. 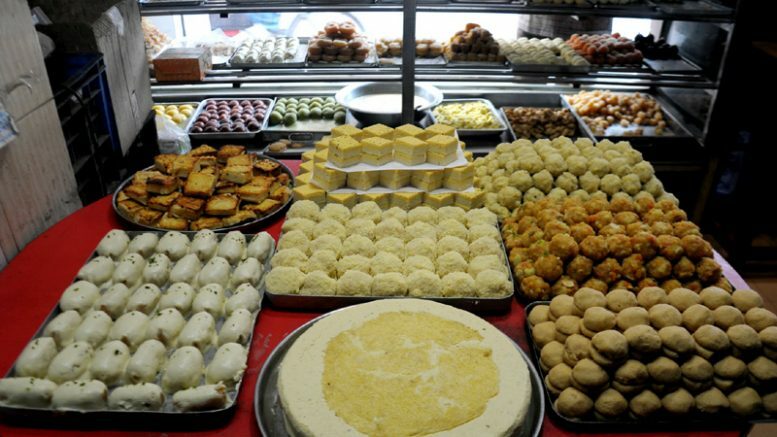 The proposed sweet hub has been titled as ‘Sar-Tirtha’, conceived and named after by chief minister Mamata Banerjee, which would include manufacturing, packaging and selling units of traditional sweet delicacies of Nadia like Sarpuria, Sarbhaja, Darbesh, Nikhuti, Khirpuli, Kesharibhog, Gokul Pithey, Aam Sandesh, Khirer Singara, Chhana Bhapa and many other items. The Nadia administration on Monday has submitted a project plan to the state small scale industries department for the final approval and allocation of fund. District magistrate Sumit Gupta said: “On Tuesday we have submitted a preliminary estimate of the project amounting to Rupees two crores. We are hopeful to get the approval and allocation of fund very soon. Our target is to complete the project at the earliest”. Sources in Nabanna said the sweet hub is part of the chief minister Mamata Banerjee’s endeavor to popularize and revive the glory of traditional sweet items of Bengal and to explore its marketing opportunities. “With this objective the chief minister conceived the sweet hubs in Burdwan’s Saktigarh and in Nadia’s Krishnanagar. Like Burdwan, the Nadia administration was accordingly advised to appeal initial project nod and for fund allocation by submitting a project outlay”, said an official. The initial nod to the proposal was accorded during the last week of December, when the Nadia administration was asked to submit detailed project plan for final approval and fund. State small scale industries minister Swapan Debnath said: “It has been decided to set up a new sweet hub in Krishnanagar. We have told the Nadia administration arrange land so that the project can become operative soon”. District magistrate Sumit Gupta said: “We have identified a 2-bigha land for the hub near government owned ‘Pather Saathi’motel at PWD more in Krishnanagar”. As per the initial plan the hub would accommodate selling counters of sweet of Nadia and manufacturing centres. “Shops and workshops would be offered to the interested sweet traders in the district through tender”, said District magistrate Sumit Gupta. “At the same time the hub would contain special enclosures for the passers by so that they can take a break from their journey at the hub and purchase sweets as well. Our objective is to deliver the sweet delicacies to the passersy by who generally avoid to enter Krishnanagar town due to time constraint and traffic congestion”, added the DM.